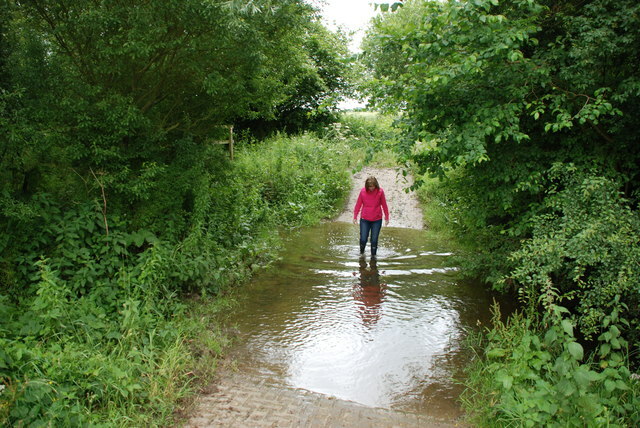 This ford on the River Stour is found at the junction of two tracks in the woods close to Weston Green. Stubble, Stour, Irony at its Peak, 2 days prior and three days from today as the storm managed not to drown East Anglia completely, for which they will be most relieved as we have high Spring Tide here in Somerset, but has struck the NE, this was researched by NE engineering geology in the late '80s '90s for a flood effect on a levee that entered through the soils into low lawns supposed to be clear but obviously suffering seepage. I saw one of those at Costwold recently where the land on the plateau floods as the river is embanked but the groundwater movement from high stream and the incoming tributary just simply swamp the soils from the base. I call it infusion of the soils by flood through the sides, common feature of silt estuary as at Avon Gorge tributary gully sites, it causes slips, slips fill and erode gully, provide more drainage catchment, increase liquefaction and extends the backwater marsh but adds to the flood zone. The beauty of this picture is your timing, we were all baking in the sub Tropical and then in comes Nadine with Biscay (Newson Hanwell 1968 Somerset shear, 1970) and some north Arctic Canada and produces a classic swirl. The farmers north were caught withe their combines in the hedges and stacks in the field, but this gentleman or lady farmer managed to clear just before leaving the impressive patterns of vegetation on the superb soils. Probably a little wet now. Stour of course had a long reputation for flood until Rivers dealt with it using the levee in part. I have seen to the south west the Northampton Warks valley zones simply swimming and floating sheep feeders, although these shallow slope gradient sites would usually be similar to that photograph of Stour. At present the arable and grassland is awash in Somerset, much of the flooding due to motorway and urban lack of drainage. When will we build our systems on high rise embankments and with plenty of pond storage and large drain cuts, it just takes a grader and we have a lot of clay and rag so it is needed (A. Millerick Microdrainage). The Mid West USA has clay pan in these soils which deep tyne plough is used to break and Minshall and Jamison (1965) researched these, so much of the water may not be obvious but it moves for days before a large storm occurs and thus every depression tends to fill, which is why EA started telling farmers to flood those and keep them for wildlife as they naturally fill. South West Cambridge toward Bedfordshire is another good valley site similar to that picture but floods for a past time in local ditch and any urban wooden section gully. There are some good weather, cloud vapour shear patterns today as the Atlantic (BBC weather) ridge comes in with blue sky high above and that with the rich greens of the wet summer and the arable cut as shown make for wonderful landscape photographs. Thanks for the observation on "film".